As you have might have seen, when you entered the blog today that we got a whole new design, I hope you loved it as much as I do. 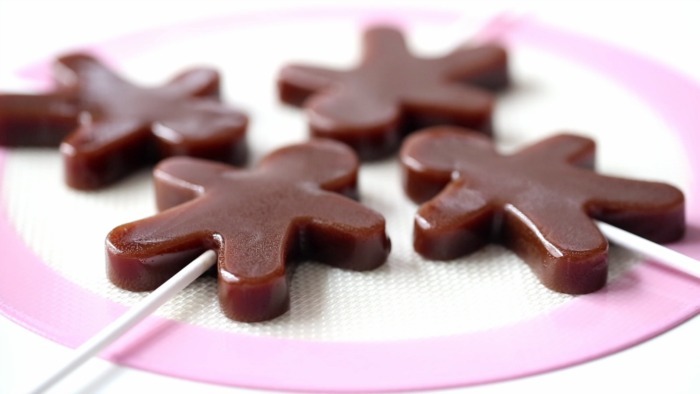 Today’s recipe is a delicious caramel lollipop, I made both a caramel flavor and one with licorice flavor, they are both so delicious. This lollipop is perfect to give away as a gift this season. 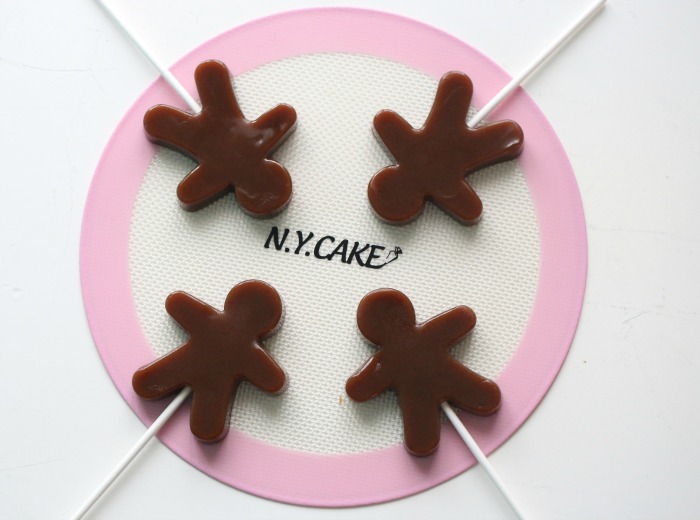 I used a cute gingerbread mold shape for these lollipops but of course you can use any lollipops mold you have at hand. The funnel I use is a product from IcaHemma, that is so smart to use when you fill these molds. At first when I saw the products I was like, what is that thing? 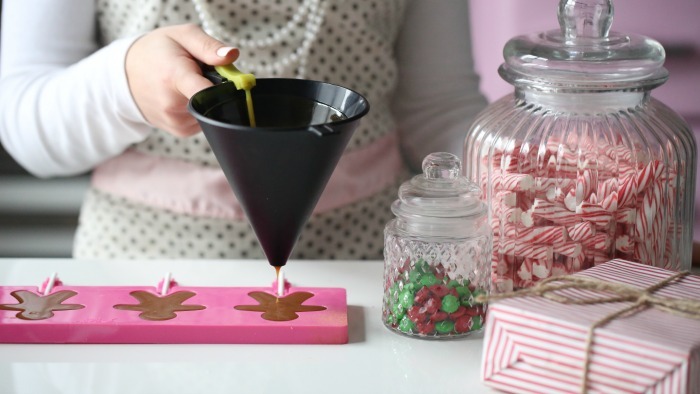 But how smart and cool is this funnel, it just makes it so more easy to pour it into the lollipop mold and no spilling of caramel at all. With your finger you can open the hole below by pressing your finger and close it in a second when you release your finger off the yellow thing on top of the funnel. just so smart, You can purchase the product here. 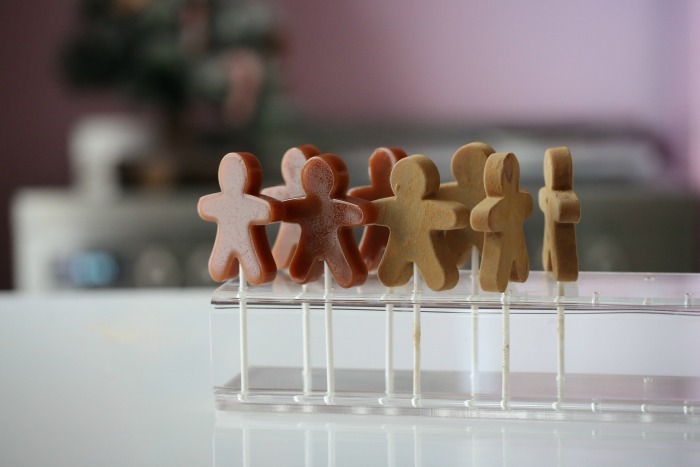 Place the lollipop sticks in the gingerbread molds if you use a mold like mine no need to spray it,otherwise Spray your lollipop molds lightly with nonstick cooking spray. Combine the sugar, heavy cream, light brown syrup and vanilla bean paste in a large, heavy saucepan. Stir until the sugar is totally dissolved. Continue cooking until the mixture reaches 257°F / 125 C° hard crack stage. Make sure you stir from time to time as soon as it reaches 257°F, / 125C° immediately remove saucepan from heat. When doing this just take your time, no need to hurry this caramel does not harden that fast. 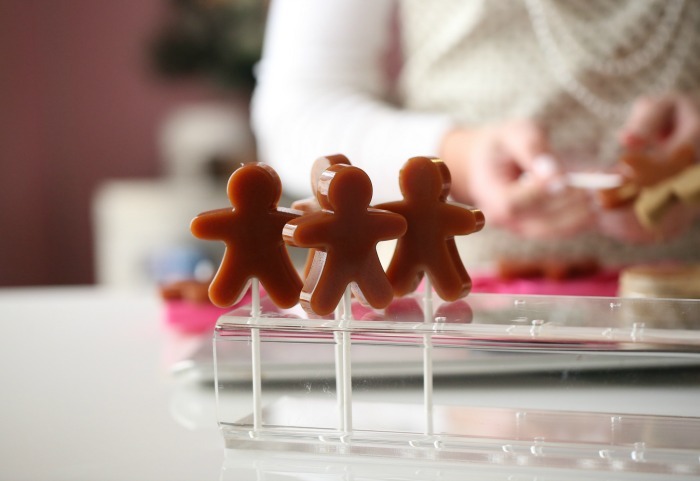 Let the molds cool on the counter, and let it sit overnight, and then remove the lollipops from the molds. 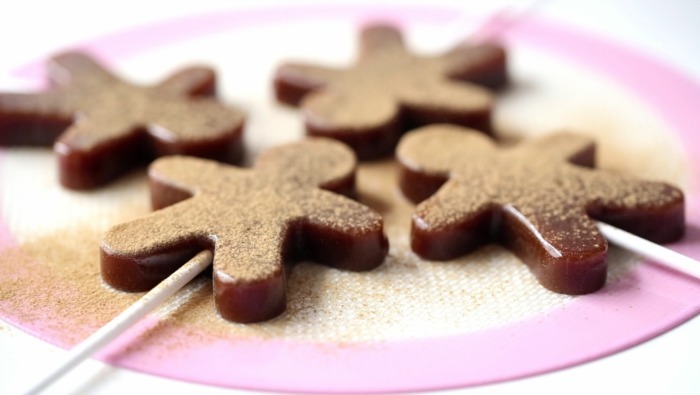 You can have plain caramel lollipops, and maybe decorate them with some gold dust on top, or drizzle some delicious licorice powder on top, these lollipops are so delicious! But add 1 teaspoon of salt licorice syrup at the end of the cooking time. and dust the caramel lollipops as soon as they are ready. Check back soon for more delicious christmas recipes. detta är väl fantastiskt. Jag köpte en på maxi i Borås, åkte hem och gjorde knäck och is choklad helt utan kladd. Barnbarnen kunde hjälpa till och ingen brände sig. Den får gärna kosta det dubbla, värt varenda krona.